This is the portable counterpart of Directory Monitor, a powerful yet intuitive program that monitors a specific directory and records any changes, such as file addition or removal. It is backed by a user-friendly feature set that can be adjusted by anyone, even those less experienced with computer software. Since there is no installation involved, you can drop the program files in any place on the hard disk and just click the executable to run. There is also the possibility to save Directory Monitor to a USB flash disk or similar storage unit, in order to run it on any PC with minimum effort, as long as it has .NET Framework installed. What’s more, the tool does not create new entries in the Windows registry or Start menu, leaving the disk clean after removal. The interface is user-friendly, allowing users to quickly add a specific folder or configure additional settings regarding filters. For instance, you can monitor only new files, modifications, deletions, renaming, file access, or events of subdirectories, as well as target files or directories only. 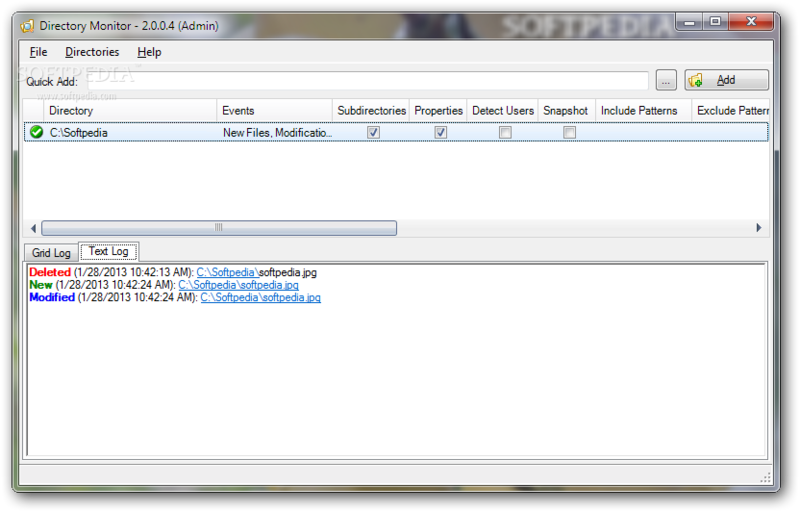 File logging can be enabled with timestamps to better keep track of all program activity. Furthermore, you can schedule Directory Monitor to run external apps, play sounds, or send notifications via email when the aforementioned events are triggered. These are just some of the options that can be configured through Directory Monitor. Directory Monitor has a good response time and works smoothly, without causing Windows to hang, crash or pop up error messages. It runs on low CPU and RAM, so it does not hog system resources. To sum it up, Directory Monitor bundles a rich set of features targeted at monitoring directories for any changes, complete with email and sound notifications.